In a country that prides itself on being a melting pot of culture, recent events suggest that our racial divides are more akin to civil war trenches than lines in the sand. Arab-Americans are finding themselves convenient scapegoats for the acts carried out by people they know nothing of, having to endure at minimum the suspicious looks of strangers and acquaintances alike, and at worse, the blind eye-for-an-eye vengefulness of a few. Racial profiling is now thought of as an acceptable and even necessary part of everyday life. Do the civil rights fought so hard for not long ago have a place in our post–World Trade Center society? Internationally acclaimed painter Ellen Gallagher’s first West Coast show, entitled Preserve, attempts to investigate the psychology of race and gender, and the fundamental nature of identity, through labor-intensive drawings and large-scale sculpture. The social commentary of Gallagher’s work uses traditional abstraction to discuss what effects past events have on the future of politics and society. Preserve contains two elements: a collection of drawings constructed from old ads from African-American magazines like Ebony and a large-scale sculpture representing her two-dimensional works in three-dimensional form. Gallagher’s work exploits the exploited by taking the visual signifiers of race used in minstrel shows — the mask of bulging eyes, thick lips, and upturned hair — and exposing them as masks of societal fear. 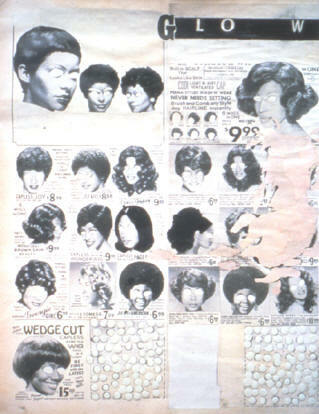 The drawings are advertisements for wigs and hairstyles taken from different black magazines between the 1950s and 1970s, reflecting an especially tumultuous and revolutionary time in American history when civil rights and feminism were at the forefront. Gallagher has modified each ad, masking out the eyes with paint and plasticene in works such as Glow and Karate, and other times covering up entire faces. In Armor Wigs, for instance, she has pasted men’s eyeless faces into the wigs. Other parts of the pictures are adorned with hundreds of abstract eyes, lips, and wigs that reflect the sociocultural spirit of the era. The wigs thus become another mask, hiding the true person somewhere behind its artificiality, assimilating the person to a prefabricated image. Like Gallagher’s blackface representations, the images of the wigs are repeated with slight variations. The repetition eventually dulls the stinging negativity of each image and reduces it to a pattern or an element in a pattern, just as the repetition of violence on television desensitizes the viewer to further images of violence. The site-specific sculpture is the only object occupying any floor space in the gallery, instantly becoming the focal point of the exhibit. It resembles an expansive, bony jungle gym, constructed out of white painted wooden dowels. The structure is covered with pieces of rubber, also painted white, that repeat the minstrel-inspired body-part images of eyes, lips, and wigs rendered in the drawings. The space becomes a site of social commentary, a structure reflecting and repeating the themes illustrated in the drawings, forcing the ideas beyond paper and into our physical realm. In one of the books profiling her as an artist, Gallagher says, “I never think of my work as a critique of stereotypes,” adding that she’s “more interested in the lives people create for themselves within these brutal constraints.” Although Preserve was created before September 11, its relationship to American society seems more relevant now than ever. The old “Those who can’t remember history...” adage comes roaring back as Gallagher highlights the mistakes of earlier cultural structures that seem to be reclaiming a place in our society now. The constraints of today aren’t as obvious as the racist caricatures of the minstrel shows of the early 1900s, but their subtle ripples point out the massive shortcomings of a culture immersed in confusion and fear, akin to the dawning of the civil rights movement itself. But we can no longer chose to view racism against African Americans, Asian Americans, or Arab Americans as an acceptable mass movement within our culture, something we allow ourselves to become desensitized to. The problem is current, individualistic, and relevant; we cannot dismiss it as a movement of popular culture. Sarah Lidgus is a freelance writer living in San Francisco.